We have a level camping ground which has a great view across the loch. Campers can have access to the Hostel self-catering kitchen facilities. We can now offer a small number of pitches for campervans, the facilities include electric hookup. We have a limited number of hard-standing pitches for campervans, on level ground which has a great view across the loch. £12 for a pitch without electric hookup per night. 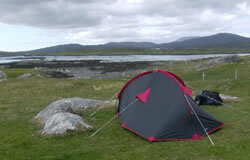 £15 for a pitch with electric hookup per night. Waste disposal facilities are available. The camping site has a separate toilet and shower area to the Hostel.